Don’t get scared by this seemingly strict diet. The benefits well outweigh the effort you must put in. It is terrific for burning off any excess fat. It a 13-day diet plan. After which, if done right, you won’t be having trouble with weight gain for the next 2 years! It is called the Danish diet or the Copenhagen diet. This 13-day diet plan is great for many reasons. One of the best things about it is that, unlike so many other “efficient” diets out there, this one doesn’t leave you ‘hanging’ on the yo-yo effect. For those who haven’t stumbled upon this term, the yo-yo effect is when all the weight you’ve worked so hard to lose comes crashing back down on you once you’ve finished the certain diet you’ve been on. Well, this regime will not only make sure you lose weight quickly, but it will also make sure you keep it off. It’s the kind of diet that speeds up your metabolism, and at the same time, keeps your weight balanced. Sounds great, but how many pounds are we talking? Well, that can depend on many factors, but generally you should be able to shed from 15-40 in these two weeks. BUT, it’s very important that, after those 13 days are over, you don’t continue this diet under any circumstances. Especially not for reasons like ‘you feel you can lose just a bit more than you’ve already lost’. This diet is extremely low in calories, about 600 calories a day to be precise. Other than that, it lacks whole grains, dairy products, and fruit. So, it can be expected of some individuals to experience fatigue due to a lack of sufficient minerals and vitamins. And, naturally, you may very well find yourself feeling hungry throughout these two weeks’ time. And in some cases, your body may be more prone to diseases. But before you decide to run away screaming, know that if you adhere to this diet without making any exceptions, you can avoid the issues mentioned above. 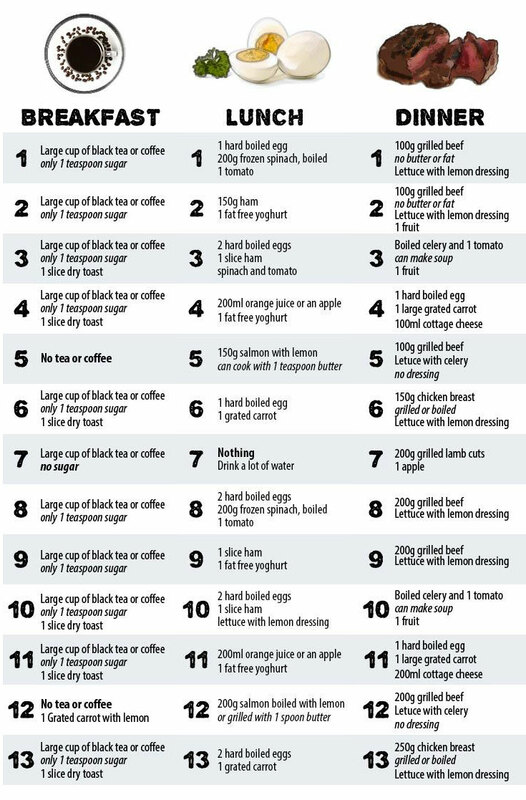 You Must Follow the Strict Rules of this 13-day diet plan! And that’s it. Now, without keeping you waiting for any longer (and, more importantly, now that you know the pros and cons and are ready to make your adult decision). This diet is amazing! I have lost 7 lbs in the first 7 days. I have stuck to it by the book. I am very worried about after I am done, what to do?